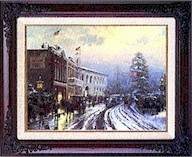 The Thomas Kinkade Classic Collection is a compilation of the best known, loved and hard to find pieces. These are genuine, authorized Thomas Kinkade replica's on canvas, sized and priced for decorating flexibility and affordability. Each comes with a Certificate of Authenticity guaranteeing that your Thomas Kinkade Classic is a genuine re-creation of the original. They are carefully crafted using the materials and methods Thom used when creating the original painting. Please view the paintings which are offered in the Classic Collection by visiting our on-line gallery. 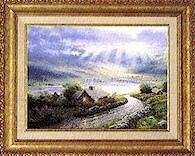 The 'C' located next to the title indicates that image is available as a Thomas Kinkade Classic. If you have any questions, feel free to call our Customer Service Representatives at 1-800-500-2304 or via e-mail at info@kinkadeonline.com. **Classics Collection current issue price. These prices are a guideline for new releases.